Got sent out to a retail site today. Had to rebuild one of the computers, so that left me with a bit of time to take in the environment I was in while the PC did the automated reload thing. So up on one of the shelves were some DVDs. Now what the hell is “Romancing The Stone” doing in amoungst that lot? That reminds me. I found a photo I took a couple of weeks ago. 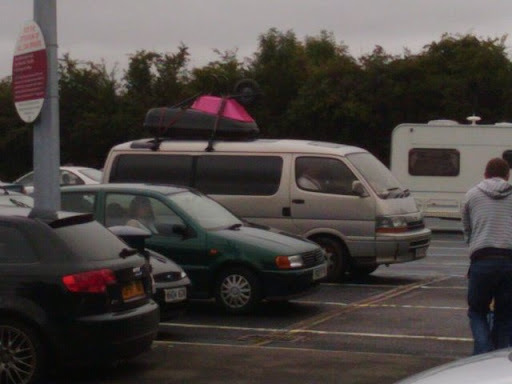 Who one earth goes on holiday with a pink wheel barrow? Ok, I was on the last service station of the M4 in Wales, so I suppose I really shouldn’t be that surprised.